Welcome to the Institute of Public Administration Australia (IPAA) ACT Division. IPAA is the professional body focused on the promotion of excellence and professionalism in public administration. We are a non-profit and non-partisan organisation that works in partnership with the public sector, the private sector, academia and other institutions, to provide a platform for debate and discussion about improving and striving for excellence in public administration in Australia. IPAA is an incorporated body governed by a constitution. You can also read our Strategic Plan 2016-18 which outlines our current priorities. Our members include all current Commonwealth Departments, the ACT Public Service, a range of other corporate members and individual members. Collectively, our membership base represents over 150,000 professionals in public administration. You can view our current members here. IPAA ACT is led by a Council consisting of senior leaders from across our membership, led by Frances Adamson, the Secretary of the Department of Foreign Affairs and Trade. Click here to meet our current Council and click here to meet the IPAA team including Drew Baker, the CEO of IPAA ACT. IPAA is a federated body with divisions in most states and territories, you can access links to our other divisions here. 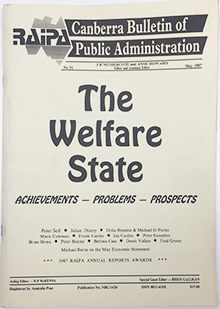 The ACT Division was established in 1953 and has operated for over 60 years in the Canberra market, operating under several names including the former Royal Australian Institute of Public Administration. 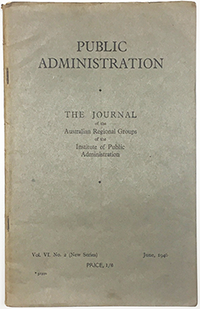 Images below - a copy of an IPAA Journal from 1946 and the former Canberra Bulletin of Public Administration from 1987.